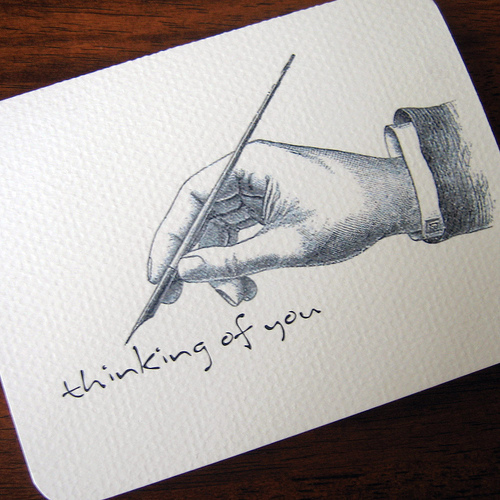 When was the last time you received – or wrote – a handwritten note to someone, just because? Sure, you still may write thank you cards and maybe even Christmas cards by hand, but when was the last time you wrote a note or letter by hand? Now that emailing, texting and social media are so commonplace, we rarely correspond with or relay our good wishes to others by written letters and notes. It is quickly becoming a lost art. Think of someone you haven’t been in touch with for a while, a beloved friend or relative. Or perhaps it’s someone you know who has been ill or struggling in mind, body or spirit. These people would be delighted to receive a note written by hand that shows they were thought of with care. Parents, try leaving a handwritten note in your child’s lunchbox. It doesn’t have to be much – just “Have a good day, sweetie! I love you” or “Good luck on your tests! I’m proud of you!” but your child will appreciate it, even if they don’t say so. I appreciated the ones my mom slipped into my lunchbox – and wished I’d saved them. Find some nice stationery, note card or even lined notebook paper, grab a pen and get writing! Tags: #24daysofgiving, Advent, devotions, handwriting, letters, notes, writing. Bookmark the permalink.